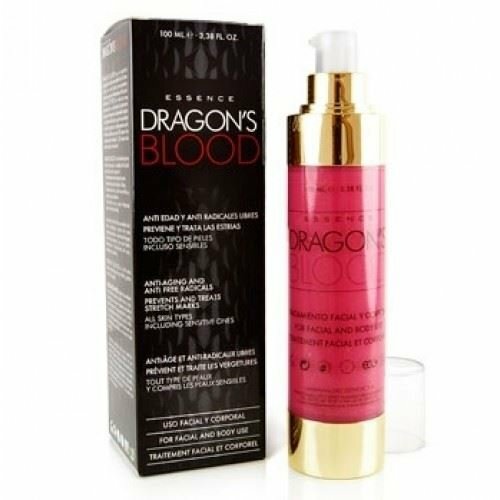 Dragon’s Blood is recommended for face and body skin care treatments including Anti-ageing treatments, Anti-free-radical treatments, sensitive skin treatments and Pre- and post-pregnancy treatments (stretch mark prevention). It contains a hydroglycolic extract from the resin of Croton lechleri tree, which has a number of beneficial properties for skin treatments. The Resin is highly regarded as a healing material. Dragon’s Blood Essence is also higly valued because of its antioxidant activity thanks to the large amount of proanthocyanidins, which are up to 20 times more powerful than vitamin C and 50 times more effective than vitamin E.
The combination of Aloe Vera from biologic farming with rosehip and olive oils, vitamin B, retinol and vitamin E, and moisturising and hydrolised soya factor, make this effect more powerful. Dragon’s Blood Essence is ideal for mature, sensitive or oily skins, or those with impurities. This is a cosmetic product for external use. Dragon’s Blood Essence has been dermatologically tested, but not on animals. Keep away from children. Dragon’s Blood Essence doesn’t contain parabens nor mineral oils. Because of its natural ingredients, keep protected from light and heat. Some ingredients of Dragon’s Blood Essence are from organic farming. Directions: Apply on clean and dry skin at any time of the day. Spread with gentle circular massages to enhance absorption. You’ll feel your skin silky-soft. The bottle guarantees that the product stays in perfect conditions until the end. Diet Esthetic Laboratories specialize in the manufacture of cosmetic, healthcare, veterinary and phytosanitary products. Diet Esthetic Laboratories are currently one of the leading companies in the sector and have carried out its activities since 1985. Higly valued due to its antioxidant activity thanks to the large amount of proanthocyanidins, which are up to 20 times more powerful than vitamin C and 50 times more effective than vitamin E.
The combination of Aloe Vera from biologic farming with rosehip and olive oils, vitamin B, retinol and vitamin E, and moisturising and hydrolised soya factor, make this effect more powerful. A hydroglycolic extract from the resin of Croton lechleri tree, which has a number of beneficial properties for skin treatments.